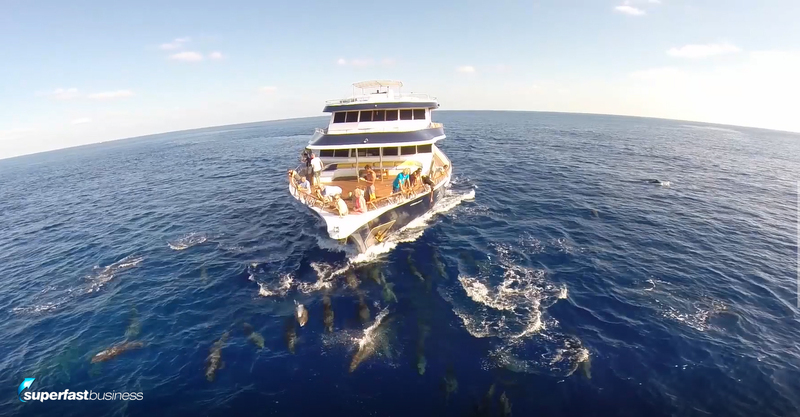 Last September, James Schramko took a group of business owners out on a boat in the Maldives. What do we discuss on a mastermind and how can you benefit? Find out in this video episode. 03:46 – What’s working best for you? 07:52 – What’s on your action list? It’s James here. I want to share with you today some highlights that I got from my Maldives mastermind trip in September 2016 because as I’m preparing for the Maldives Mastermind coming up in 2017, which is in September, I’m just going through and reliving some of the experience. It’s really quite phenomenal. You get off the airplane at the airport in Mali, and you step onto the tender that takes you out to the big boat. And that first night, they have a welcome drink, the air is warm, you find your cabin, you sleep, you wake up the next morning in paradise, like aqua-colored water. There’s this shift that goes over you. Then what I did is I took guests through some facilitated business mastermind exercises. In addition to sitting down with each one of them individually over that week. So I just want to share some of the things we talked about. Maybe it’s time for you to do a reset on your business. So you can do this by yourself at home. You could do it next time you’re away. I really recommend you do these things when you’re away from your business because it gives you more perspective. Of course, you could do it with me in the Maldives in September as well if you’d like to do that. So, when we got together, of course there’s this group dynamics. It’s people coming together. It’s a new group. You’ve got to find out who does what and where they’re at and learn more about them. So I do an introduction exercise where I take people through a mindset exercise, opening them up for the experience and helping them be ready to make change, because that’s what I would like to have happen over that week. I want them to come out of the end. So when you’re sitting down doing your planning, think about what result do you want, what does success look like, and where do you want to move to. So that’s what we do there. We share something each so that we can start to feel for who’s there. The next thing that we do is we go deeper into people’s specialties, not only what they’re really good at but what they really want help with. So I start joining people up naturally. And you’ll find that over the breaks, over the snorkelling sessions or the breathing exercises or the lunch on the deck, or the dinner or the breakfast and the casual couch conversations that happen, people gravitate towards the people who are like them, people who have a strength they’re interested in, but also if people can solve someone else’s challenge, they’re going to gravitate there and help them out, which is just wonderful to see. Then the next exercise we do is called a PEQ, and I learned this technique from Ed Dale, but it’s like a hyper brainstorm. It’s not just a blind one where the strongest people in the room get the most say. It’s around about more democratic version of a brainstorm. It’s releasing great ideas and then democratically voting for the best ones so that we can spend time on that. If you like, we would 80:20 the biggest challenges that people are having and I teach and help on those challenges. And if someone else there is a specialist, for example, Keith Krance who came on the last one is obviously a world, elite-level specialist at Facebook, he was able to share with us the highest-converting video campaigns that he’s running, the ad format that works the best, the specific call to action, and he showed us a number of examples of how this was working. So we could take that away and execute in our business. The next session we did is like a sharing session where we talk about the things that are working best for us. And out of a dozen people, you’re going to get an action list of a dozen things that are working really well and the chances are that you’re not doing all of those. So that worked really well as well. The next one, we talked about connecting up resources. So find out what people really need and making sure they get the connection, whether it’s a person, whether it’s an idea, whether it’s being able to sit down with someone who can show them. Then I went into geometric growth. I’ve really been studying this lately. I have a stack of books like this high. Jay Abraham gave me some fantastic information he shared with me, and I’ve been studying that and going through the geometric growth levers in more detail. It’s what I do every week with SilverCircle and I answer hundreds of posts in SuperFastBusiness every week. So I’ve got a lot of depth in this. So I basically zoom in on where the money is in the business. And I can give you a few clues here. One is it’s almost definitely in frequency of purchase, which is why I’m a huge fan of recurring subscriptions. The other places to look at are conversions because it’s a small number and it’s easy to impact. And then beyond that, you have a look at things like pricing, and positioning, and so forth. There was a couple of other things we went through. Then we went into some of the other areas. My friends like Dean Jackson talk about profit activators. I’ve taken a leaf from his book and gone through some of the things there like getting faster traction by focusing on a single target market. We have here how to educate and motivate people through emails in particular. I have a number of specialists in my sphere, whether it’s Dean Jackson or John Logar, who are specifically making huge headway with emails. I have written dozens and dozens of emails now for members that actually work. They sometimes send me an update saying, “Oh my god, eight out of 10 people replied to this email. Nothing I’ve tried before has ever worked liked this. This is amazing.” So I share the results. I share exactly what I wrote for those emails. We talk about after sales and the lifetime customer philosophy and so forth. Then we talk about what your market really wants and what they would like to have and how you can help bridge that gap for them. So we’re talking a lot about the way that you structure your business and how you can be effectively delivering them value for a sustained long time. That would allow you to go on a trip like the Maldives and not even bat an eyelid. An investment of $5,000 or $6,000 would be something you look forward to. 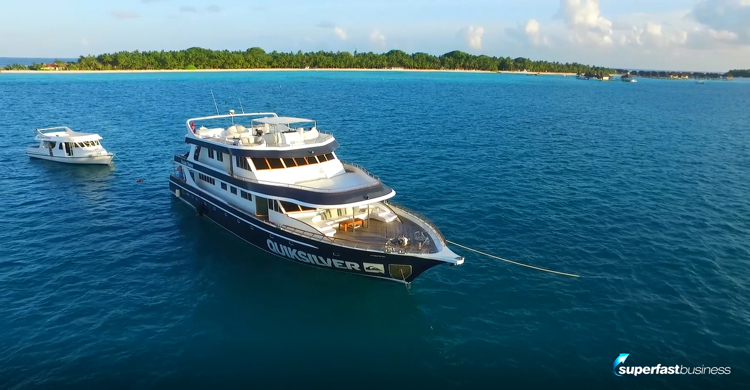 You want to have a week away on a luxury boat fully catered for in beautiful twin share, luxurious lounge, crystal clear water. That is something you’re excited about because your business frees you up to do that. It’s so unfortunate that the people who say, “Oh, jealous.” Or “I wish but I can’t afford it,” or “Maybe next year.” Those people are stuck. They’re stuck in their inbox, they’re stuck with an inefficient business model, they’re stuck with the wrong pricing policy, they’re stuck with one-time purchases, they’re stuck with bad training from wherever they got it before, and unfortunately, they’re the ones who need this the most, but they’re not there. I talk about how you can have a business that just pays you forever. My business is a seven-figure a year business. I work two days a week, primarily with outbound calls is Wednesdays, and the rest of the time, I make a piece of content here or there and I travel a fair bit. You’ll know that if you follow me. I want to share with you the blueprint for that. It’s in this book. Then we do summary actions. I make sure that people are getting something from this trip. They go home with a specific plan on what to do next, how to get it going. I give every resource possible, whether it’s a link to specific information, whether it’s hooking them up with how to get the perfect VA. I’ve got all of these things in process now, and I follow up afterwards. We have the ability for private coaching within SuperFastBusiness membership from an app, like you’re on the phone, which is great. And then I just talk about breakthroughs, and we go around and we talk about what was the big thing you got out of this. We really lock it in and bring it home. That’s why I’m so excited. In fact, I look here in my notes, I’d written down which boards to bring next time, I’d refined my quiver. You do not have to be a surfer to come on this trip. That might be a misguided perception. Yes, it’s a great surfing destination. Of all places I’ve surfed, I enjoy this one the most because the waves are easier, and they’re long and beautiful, but it’s also an incredible place to do snorkeling, scuba diving, swim with the manta rays, observe dolphins and wildlife. It’s not that populated. It’s luxury living. I just love that all the meals are prepared for you too. I actually wrote down my own action list. I can see I’ve crossed off a huge amount of them. I had decided to focus more on revenue share deals, which I’ve put a few in place since the Maldives. I have rolled out my ASK funnel for SuperFastBusiness, which is great. I’ve sold things that I didn’t feel I needed anymore – assets. I’ve done things like hook up with my author for publishing a book. Managed to plan a few events, update all my tax and all that sort of stuff. It really is hard to explain but when you get on that boat, and you have the clear distilled thought track, you start with a workbook and a guided facilitation, me helping you, you come out of it. So I recommend you do this for your business. Try and do it every 12 weeks. I just came back from Indonesia, but already this year, I mean it’s May and I’ve been to Bali, the Philippines, Fiji, the north coast of New South Wales, and I’ve got plans to go to Spain, London, the USA, Hong Kong, the Philippines and the Maldives for the rest of the year. It’s already in the book. If you want to be doing that stuff, I encourage you, come along to the Maldives with me if there’s still a spot left. There’s only 12 people per trip. There’s two trips. One couple is coming on both weeks, which is great. And I’m also there for both weeks. If you want more details, it’s SuperFastBusiness.com/Maldives. I hope to see you there. But if you can’t come, at least book yourself a weekend away somewhere. Take a blank workbook. Use some of the exercises I’ve talked about in this video, and get yourself some progress in the business. 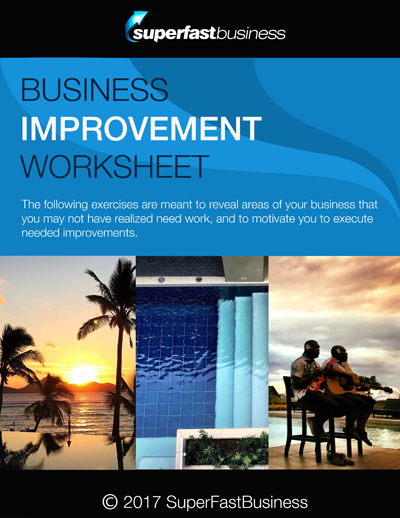 I’m going to ask my team to summarize the exercises that I talked about in this video as a downloadable exercise, a PDF worksheet at SuperFastBusiness.com/getaway. That will get you straight to this episode and you can get that checklist. Go through it and see how you can boost your own business. I hope you got some value from this. If you got any comments, or if you’re not a member of SuperFastBusiness, make sure you join the waiting list and get in there. 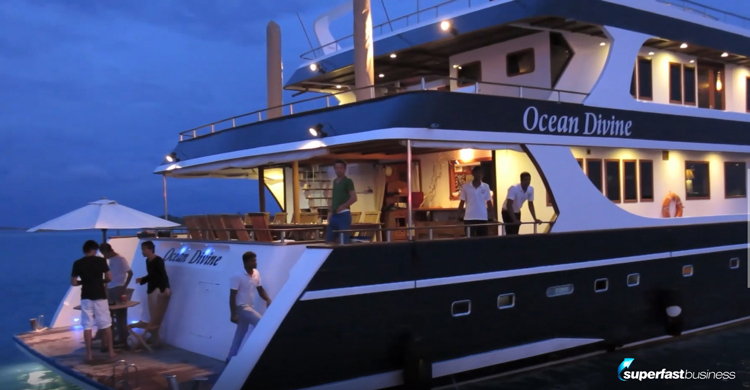 I’m looking forward to helping you with your business, whether it’s floating around a luxury hundred foot cruiser in the tropics or from the comfort of your own app, I’m here to help.